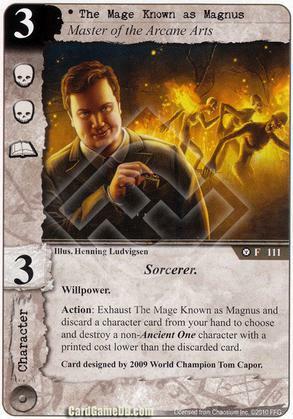 Flavor Text: Card designed by 2009 World Champion Tom Capor. haha, well I do have to agree that is one awesome card you created there. Seems like an all-around nice three-drop character, especially with the new attention Sorcerers are getting lately, thanks to Nephren-Ka. Willpower, equal skill and icons to cost, and a means to destroy anything bar an Ancient One so long as you have the cards for it is never bad.